For those that are looking for a change of pace in Casino playing or happen to be new online Casino players looking for a great Casino platform to enjoy, then Casino.com would be an excellent choice. It is not the largest nor the smallest Casino available online but what it has to offer is exciting and packed with fun. It is a casino that has made sure that they have lots to offer everyone who is interested in online casino gaming entertainment. 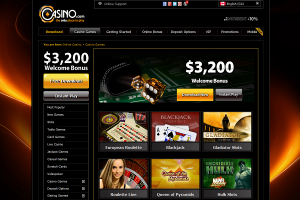 This site has been up and running since 2008 and is included in the Mansion group of Casinos. Most often, one of the favourite categories to play at online casinos is slots. Here at Casino.com there is a good selection that comes with a lot of variety. For those that like the classics there are plenty of three reel slots to choose from and those of you who tend to lean towards the enjoyment of the action slots, you won’t be disappointed too. All slot players are looking for the big jackpots and there are plenty of opportunities with the Progressive slots that could put a great deal of money into your pocket. For table game players Casino.com is going to keep you busy. Your choices are going to be among variations of Blackjack, Roulette, as well as there is Baccarat and Craps to enjoy here. The list of exciting games doesn’t end here as there is Video Poker as well as Arcade games, and Scratch Card games when one is looking for a change of pace. Casino.com has recognised the growing interest in Live Casino options and have made sure that they offer a selection for their account holders to take advantage of. These include several different versions of Roulette as well as Baccarat, Blackjack and Live Casino Hold Em. Casino.com has chosen to keep it simple with their choice of Casino software providers and have chosen Playtech. Playtech is well known within the industry for being able to offer exceptional Casino game choices with a lot of variety and clear crisp graphics with enticing themes. One of the greatest enticements to begin playing at casino.com is their Welcome bonus. This can put an extra $3,200 into your account for free play. It all begins with the Casino providing you with a match up on your first deposit to a max of $400. While this is a great offering it continues with seven more reload bonuses that can amount up to a max of $400 each so when all of this is added up, you have a potential of receiving $3,200 in Casino money to enjoy. Every Casino has terms and conditions when it comes to their free bonus of money and Casino.com requires a 40 times a play through for their Welcome bonus. Casino.com is not going to disappoint those that wish to play the mobile version of their Casino. They offer a couple of options for mobile versions such as the iPhone Casino or Android casino. The Casino has put a great deal of work into optimizing many of their games to make them available to the mobile version players so they can be played anytime and anywhere. Casino.com has made it a point to offer as many of the most common payment methods possible, and they include Paysafecard, Visa, Neteller, Mastercard, Maestro, Entropay, and Ecopayz. They also offer several different methods for withdrawal with several of them being the same as the payment method as well as bank wire. Casino.com has made sure that they have knowledgeable representatives in place to handle customer service inquiries that are available through email phone and live chat.